Properties in Buisson average 4.7 out of 5 stars. Property 10: Medieval charm and soaring vistas in the heart of Provence: what's not to love? 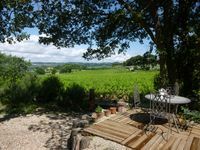 Property 20: Cottage with pool in a quiet hamlet in the heart of orchards: authentic stay! Property 39: Stone house "chives"
Beautifully restored Provencal village house with private South facing terrace. Property 45: Beautifully restored Provencal village house with private South facing terrace. This is a great little house that is off the beaten path and still accessible for day trips to the surrounding area. Maria is a friendly and attentive host with great suggestions for local restaurants and wineries. We were able to visit Vaison-la-Romaine, Orange, Chateauneuf-du-Pape and a variety of fabulous small villages and vineyards in the area. We loved to eat breakfast outside overlooking the vineyards and even had a dinner watching the sunset. The jacuzzi is private and very relaxing after a day of sightseeing. Thanks for a lovely stay Maria!